Recently, in advance of his 53rd birthday, Japan's Prince Akishinonomiya held a news conference in which he managed to stoke fresh controversy over a question that continuously roils Japan. A news report on Akishinonomiya's press conference. Akishinonomiya's presser with his wife, Princess Kiko, was eventful in more ways than one. Akishinonomiya is the father of Princess Mako, whose pending marriage to civilian Komuro Kei has been embroiled in controversy due to the large debts held by Kumoro's mother. The debt has raised concerns in the Japanese press that the severance money that Mako will receive as compensation for leaving the royal family - i.e., taxpayer money - will be used to pay for a private citizen's debts. At his press conference, Prince Akishinonomiya admitted that the marriage is unlikely to happen, which raises the odds that the Princess' engagement is doomed to fail. But Akishinonomiya managed to stir even more controversy with comments he made about the scheduled ascension of Crown Prince Naruhito to the position of Emperor next year. The Prince made it clear that he believes a key ceremony of the ascension, known as the daijousai (大嘗祭), should be funded by the Emperor's personal funds - i.e., it should not receive any form of taxpayer support. It's pretty shocking for a member of the royal family to raise such an issue in public. Typically, these internal matters are kept strictly between the royal family and the kunaichou (宮内庁), a.k.a., the Imperial Household Ministry, which is responsible for managing the affairs of the royal family in accordance with the Imperial Household Law. Akishinonomiya made it clear he tried to have that conversation with the kunaichou, but that "no one would listen to me" (聞く耳を持たなかった). (JP) Link: Akishinonomiya Expresses Doubt over Daijousai Expenditure; "The Kunaichou Wouldn't Listen"
To understand why this is controversial, and why Akishinonomiya would make this suggestion in the first place, it's necessary to understand some of the history behind the relationship between the native Shinto religion and the Japanese imperial household, how this relationship changed after World War II, and why some Japanese remain very wary of an overly religious royal family. The fall of the Shogunate is called the Meiji Restoration (明治維新; meiji ishin) because its proponents believed they were returning Japan to its "original state": a monarchy ruled by an Emperor regarded as the direct descendant of Amaterasu Ookami (天照大神), the Sun Goddess. Whether it was truly a restoration or a clever invention of Meiji intellectuals remains hotly debated. What's undebatable is that, from the start of the Meiji period to the end of World War II, the Emperor ruled Japan as an extra-legal, divine sovereign - the descendant of the Sun Goddess, Amaterasu Ookami (天照大神), and the father figure of the nation. The Emperor's portrait was placed in classrooms across the nation, and education regarding the Emperor's sovereignty, spelled out by the Imperial Rescript in Education, made inculcation of fealty to the Emperor part of every Japanese citizen's compulsory education. In the aftermath of World War II, this enshrinement and devotion to the Emperor was seen as a major motivator of Japan's behavior leading up to and through the war. A major debate ensued regarding how much responsibility Emperor Hirohito had for the actions of Japan's military leaders, and whether he should be tried for war crimes. What followed was a protracted negotiation between the Japanese Diet and the Supreme Command for the Allied Powers (SCAP), the occupying force in Japan led by US General Douglas Macarthur. The Japanese government wanted to preserve the emperor system more or less in its entirety. Japanese intellectual Minobe Tatsukichi, who works arguing that the Emperor should be an "organ of the state" were banned in Wartime Japan, argued vociferously that a system akin to the British model - a strong monarchy alongside representation democracy - was the only way to ensure a smooth transition to a peaceful, post-War Japan. But ultimately, it was the arguments of philosophers such as Watujsi Tetsurou and Sasaki Souichi that carried the day. Watsuji, in particular, argued that the "Meiji Restoration" was actually a Shogunate-influenced corruption of history that made the Japanese people vassals of the Emperor, much as the samurai and people of Japan had been regarded as vassals of the Shogun and of Japan's provincial rulers, the daimyou. The only path forward, they argued, was to remove the Emperor completely from politics. He would be regarded as a symbol of right and justice, with all Japanese citizens seen as equal before him. This move to a symbolic emperor system led to a thorough de-mythologization of the royal family. Hirohito personally embarked on a meet-and-greet tour of the country in an effort to humanize himself, and remove the impression of him as a deity. News coverage of the imperial family in subsequent decades took a "human interest" tone, with the royal family depicted, not as gods, but as a model Japanese family. Discussion of the Emperor's possible role in activities during wartime Japan were, for the most part, studiously avoided. While the Emperor ceased to be a god, the royal family's relationship with Shinto didn't end. Instead, it was merely separated from public life. To this day, private Shinto rituals occur within the royal palace, with 20 of these ceremonies being holdovers from prewar times. However, these are largely funded by "money in hand" - i.e., with the personal funds of the royal family, as opposed to public taxpayer funds. Even though the first televised rite of the funeral morning-the "Departure of the Imperial Hearse" (jisha hatsuin no gi), the transporting of the coffin onto the imperial hearse and the cortege's departure from the Palace-was a "private rite," it was just as visible to the television-viewing audience as the later "state ceremonies. ,8 The moment the motorcade passed through the Palace's main gate and onto the Imperial Plaza for its 6.5 kilometer journey to the Shinjuku Gyoen funeral grounds, the ceremonial entered a public, "state ceremony" phase, formally called "The Imperial Funeral Procession" (taiso no rei souretsu). The funeral procession through the streets of Tokyo lasted about an hour. The next stage of the funeral, "The Ceremony at the Funeral Pavilion" (souden no gi) was a private "Imperial Household Rite," which started with the coffin's transferral onto an archaic-looking palanquin, the soukaren. Fifty-one men dressed in Heian-period court garb, and accompanied by a procession made up of some 250 people, carried the palanquin for about 200 meters before placing it in the funeral pavilion. The various rites making up the "Ceremony at the Funeral Pavilion" lasted for almost an hour and a half. At 11:55, a black curtain was drawn across the front of the funeral pavilion. Then, at 11:58, the curtain was drawn back to reveal that the religious paraphernalia-the sacred omasakaki bush and the torii or shrine gateway-had been removed. With the religious objects no longer in view, the next "state ceremony," taiso no rei ("The Imperial Funeral") began. In the last transition, the private "Imperial Household Rite" that would conclude with Hirohito's entombment began at the entrance to the Musashino Imperial Mausoleum in Hachioji City, located some 50 kilometers west of central Tokyo. As a result, the Communist and Socialist Parties largely boycotted any ceremonies branded as Imperial Household Rites. Their stance was that such rites foreshadowed a potential return to the Meiji-era enshrinement of the Emperor as divine, with all the catastrophe that entailed. Which brings us to the present day and the controversy regarding the daijousai (大嘗祭), a ceremony that is performed by every new Emperor upon their ascension. Through this ceremony, the Emperor is said to take the essence of the sun goddess Amaterasu into his own form. The ceremony is the first performance of the new Emperor of the niinamesai (新嘗祭), the yearly offering by the Emperor of rice to the gods in hope of receiving a bumper crop. The ceremony is said to date back to Emperor Tenmu, Japan's 40th Emperor between 673 and 686 A.D. It is, in other words, a ceremony strongly rooted deeply in history, but also steeped in Shinto belief and tradition. Besides the fact that it's an intensely religious ceremony, the daijousai is also pricey. As described by the Nikkei, the ceremony requires a custom venue, the daijoukyuu (大嘗宮), which is built a week before the event over the course of three days. When the last daijousai was held in 1990 to enshrine the current Emperor Akihito, the venue alone cost 1.4 billion yen (around 12.5 million USD) to construct, and total expenses for the event topped 2.2 billion yen (almost 20 million USD). The expense, coupled with the religiosity of the ceremony, led to an outcry even then that the government wasn't respecting the separation of church and state that has been tradition in Japan now for 70 years. For example the ascension ceremony is being conducted as a public event. But the Daijousai is an imperial household event, and one that, in a certain sense, has taken on a strong religious tint. The question is, is it appropriate for public funds to be used for something so strongly tinted with religion?... But when we talk about the relationship between religious ceremonies and the Constitution, I think it should come from the family's budget. That will incur a large cost, but I think the Daijousai itself is something that should absolutely happen. It wasn't sudden - he replied because he was asked - but even so, I was surprised by Akishinonomiya's statements on the Daijousai. But his opinion that the ceremony shouldn't use public funds but should be "its original form, a ceremony kept within the royal family's means" and paid for by the royal family's funds is an extremely respectable opinion, and I was both comforted and deeply moved by his moral outlook. This is why people are saying that the Imperial Household is decent in an Abe Administration that's lost all sense of restraint. At Mag2 News, Uchida Makoto has a good round-up of the reaction from the editorial rooms of Japan's major newspapers. 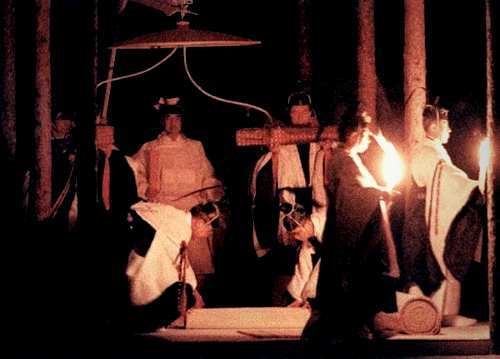 The Daijousai is a religious ceremony. We can't allow the use of public funds in light of the Constitution's separation of church and state. His comments are spot on. By contrast, the more conservative Yomiuri Shinbun came out staunchly against the Prince's suggestion. One piece quotes the head of the Imperial Household Agency as stating that they have explained to Akishinonomiya that the daijousai is an important tradition that the public largely supports. The paper even quoted one expert who accused the Prince himself of violating the Constitution by interfering in politics. This criticism was batted back by the liberal-leaning Tokyo Shinbun, however, which argued that "a private event of the imperial household including [religious] rituals of the court should be decided by the imperial household itself." Tokyo also took the economic argument, pointing out the folly of spending 20 million dollars of public funds in Japan's struggling post-bubble economy. The modern daijousai has passed the 100 year mark. Looked at from the standpoint of tradition, I can't say that the government's judgment is mistaken. But there should probably be a debate over whether a ceremony designed for an age where the Emperor exercised political sovereignty it suitable to an age with a Symbolic Emperor. Beyond just the expense, the government must thoroughly explain and make the meaning of the daijousai well known to the people. For all the commotion, however, it appears that, for now, the government is moving forward with the spectacular and expensive daijousai of yore. Unless the Japanese public raises as much outcry around this 2 billion yen expenditure as they have around the 4 million yen in personal debt held by Komuro Kei's mom, odds are Japan will still be debating this issue when the next Emperor ascends to the throne. Titus, David A. “The Making of the 'Symbol Emperor System' in Postwar Japan.” Modern Asian Studies, vol. 14, no. 4, 1980, pp. 529–578. JSTOR, JSTOR, www.jstor.org/stable/312247. Fujitani, Takashi. “Electronic Pageantry and Japan's ‘Symbolic Emperor.’” The Journal of Asian Studies, vol. 51, no. 4, 1992, pp. 824–850. JSTOR, JSTOR, www.jstor.org/stable/2059038. QR Code of the Gods: Will Tech Save Religion in Japan? From drone-riding Buddhas to monk rentals on Amazon, Japan's temples and shrines are finding unique ways to stay solvent during uncertain times. A monk who sparked an online rebellion gets his fine thrown out - but the issue of whether monks are legally allowed to drive in robes is far from resolved. How Japan's most popular New Years custom has changed over the centuries. Shinto is more than a religion - it's also an indelible part of Japanese culture. Krys Suzuki discusses the structure, beliefs, and complex history of Japan's native faith. How did a non-Christian nation make a holiday rooted in Christian tradition its own?